Please Visit: http://www.gps123.org/ User Name: ID number, Password: 123456 to check our GPS online tracking software. Q: What does the RF-V16 do? A: It is a security device for emergency communications capable of being remotely monitored. Basically, it is a miniature mobile phone limited to calling any 2-5 pre-programmed numbers, which makes it ideal for children and seniors. Q: What’s the difference between a RF-V16 and a mobile phone? A: The RF-V16 is tiny (4cm X 3.5cm X 1.5 cm), extremely light weight, simple to use in that it operates with a single button push. Both the RF-V16 and a mobile phone require a SIM card and both can receive calls from any phone. Q: Will the RF-V16 work with any SIM card? A: Yes. With all GSM network. Please note the RF-V16 use the Micro SIM card. Q: Which function does the RF-V16’s SIM need ? A: Please make sure the SIM have Caller id and GPRS function ,please close the voice mail function.and closed the pin code function . Q: How many GPRS data does RF-V16 need monthly ? A: Less 30MB/month, Our test results showed 20MB is enough. Q: Is it hard to program the RF-V16? Q:How long does the RF-V16 last between charges? 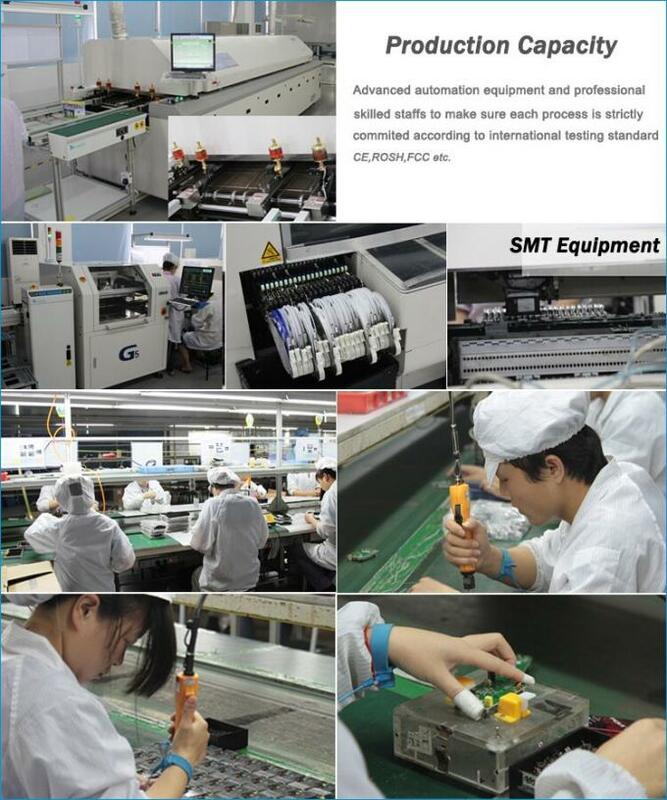 A: Close GPS tracking function, only keep communication ,it will stand-by 12days. Turn on the GPS tracking function, and every 10 min update location , it will work about 50 hours. Turn on the GPS tracking function ,and verey 2 min update location, it will work about 6 hours. Talk time is about 4 hours. please choose the corresponding work mode and position reporting frequency. Q: Is the RF-V16 waterproof? A: Water resistant, yes. Waterproof, no. Q: Are children more vulnerable to cell phone radiation than adults? Q: Why is the RF - V16’s radiation so low? So when the mobile phone with very poor signal, the RF-V16 may be no signal. Q: After GSM antenna signal is reduced, the child will not get any help during they are in danger? A: When the signal is weaken, it will affected the GPRS function at first, and then the SMS function, finally the voice communications. 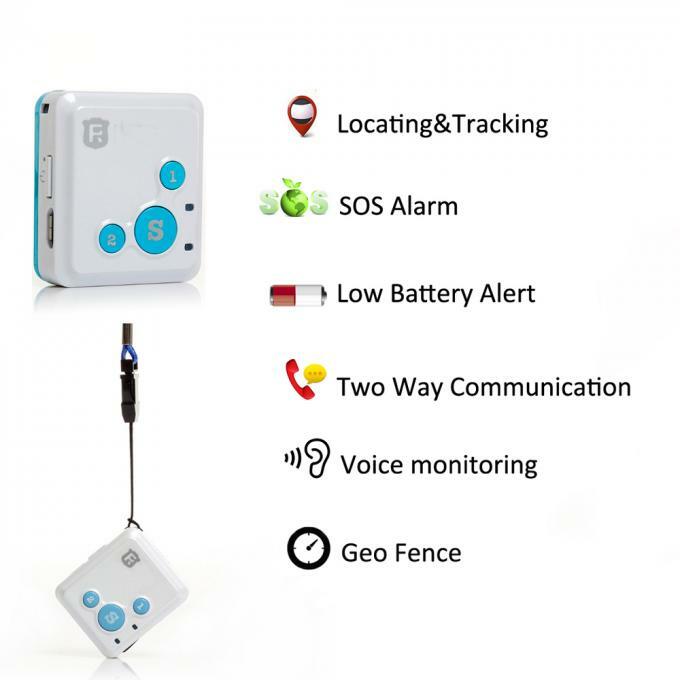 So when the kids encounter danger, they can press any key for a SOS call preferentially, even if the tracker under an extreme conditions, it also can ensure the communication smoothly. Q: How about the RF-V16’s GPS Positioning accuracy? A: GPS Positioning accuracy is 10-15m with open sky ,clear and cloudless. Within general situation the GPS positioning accuracy is about 30m. When the device indoor,it will use the LBS location , the positioning accuracy about 200-800ms, Our test results showed that location accuracy averaged between 200-800 metres. Your results may vary depending on the positioning of the cell phone relay towers and the service provider chosen. Q: Compared with the car GPS, why does V16’s positioning accuracy less to the car GPS? A: 1. Because of car GPS board size is large, so the internal circuit interference is small, and the GPS antenna size is more than V16. So the precision is relatively will better. 2. As a result of V16’s positioning is single positioning, So accuracy is less than continuous positioning products. Q: Why does RF-V16 useing single positioning? A: All personal GPS tracker have a big problem , battery life. In order to save battery life, the RF-V16 will close the GPS function when upload the positioning data to platform.so V16 every location is actually cool boot. If set the V16 positioning interval to 2 minute, the GPS will never go to sleep then the positioning accuracy would be much better, but the standby time will short about 6 hours. 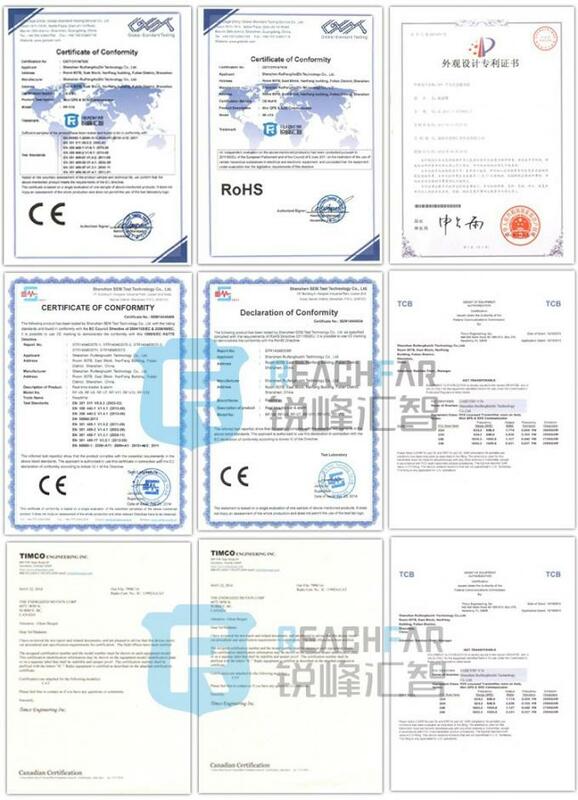 Q: The RF-V16 reply :ID:8401019128;GSM:good, GPS:sleep, battery:70%, model:AJ,tracking:ON. When I send dsp#,but what is the mean GPS :sleep? A: In order to save battery life, the RF-V16 will close the GPS function when upload the positioning data to platform. That is mean GPS only work a short time, Most of the time the GPS is sleep. So the GPS situation is sleep. Q: Why do the devive send different messages when dw# ? 3,Tracking off(with goff# command) or GPRS not work.GPS positioning success ,the SMS should be: http://maps.google.com/maps?q=N22.550892,E114.080124 . Q: The map link is not accurate when we press S button ,why? Time is very important, so we don’t waste any time to get GPS data ,so we must send SOS message with LBS location and SOS call timely. Q: RF-V16 take 1-2 min then reply the location to me ,when I send dw#. Why? A: V16 every location is actually cool boot. So it will take 1-2min to search GPS signal. Q: Can we charge the RF-V16 and use it in same time? Q: Why does the RF-V16 will make ring every 5 min? A: That is may the RF-V16 auto reboot . 1. Please check if the SIM inside. 2. Please check if the GSM signal is good. If the RF-V16 can not search the GSM network,it will reboot. Q: When does the platform start the billing? A:When the frist data upload to platform,then the platform service was activated. It will be free one year. Q: In addition to need to pay SIM card fee to the telecom operators,Is there any other fee? A:Yes .the user also need pay the platform service fee. The first year is fee,it will charge $10/year/ID for GPS device . Q: Is that mean we can not use the device if we have no pay the platform fee? Q: Why does the platform can not update the RF-V16’s location? 1. Please confirm the SIM card has GPRS data function. 3. The GPRS network is not good.some times the Network traffic jam. For example our phone call and SMS work well .but can not open a website. Q: Why the RF-V16 refuse all SOS number call with mt# and aj# situation? A:Please confirm the V16’sSIM have caller ID function. If not ,the V16 can not identify incoming call number,so it will refuse all incoming calls. Q: Can we replace the battery? A: No. The V16 was designed for children and older , for the safety reason ,the battery is build in ,can not replace. Q: Why do you use a bigger battery for V16? A: The battery bigger means the V16 should bigger, The V16 was designed for children and older, they need a communicator easy to carry frist. Q: If you company closed, then the device will not work? A: There is long term sustainable growth space in personal security products , our company has invested millions of money to establish the platform and product research & development, there are more than 10 project are under development. In the foreseeable future, our company will long for the general customer service.We insist on sustainable development, all the platform fee will be used for maintenance platform. 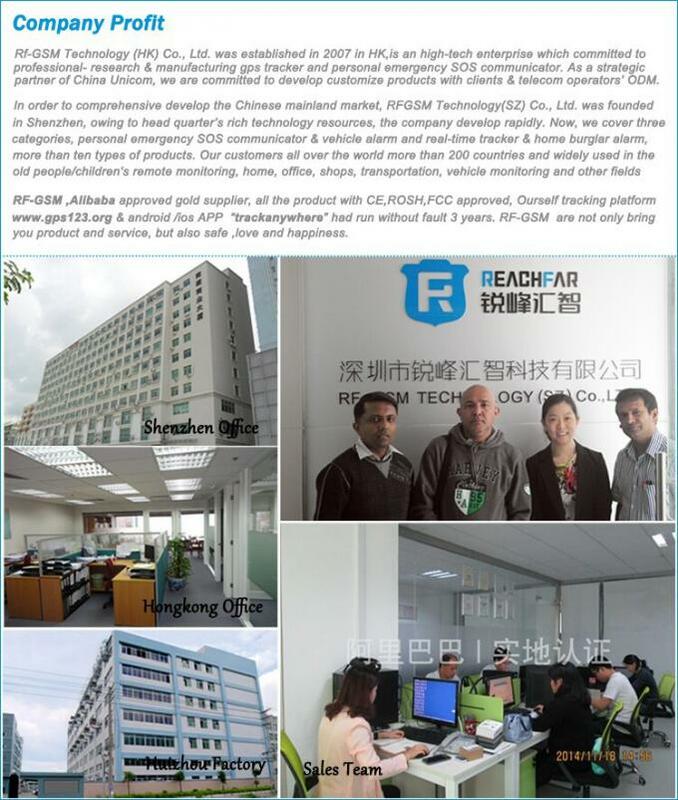 Even the transformation of our company to do other business, we will also continue to maintain normal operation of platform. Q: Why the GPS tracker need GSM SIM card? A:RF-V16 not only a GPS tracker ,but also is communicator, so it is must need a SIM card to make communication to SOS number and the platform. Q: What is the HS code for RF-V16?